Happy Meal and I were still a little gun shy about eating pricey burgers by well-regarded chefs at upscale Orange County malls after our DG Burger experience. Still, Marc Burger (part of Macy's Signature Kitchen) at the South Coast Mall was both Zagat and Gayot rated. 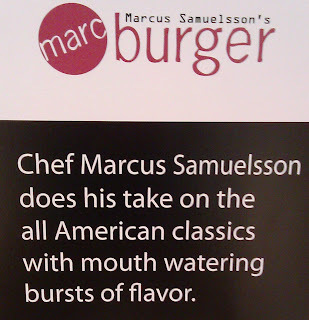 Besides, the signage promised "mouth watering bursts of flavor". 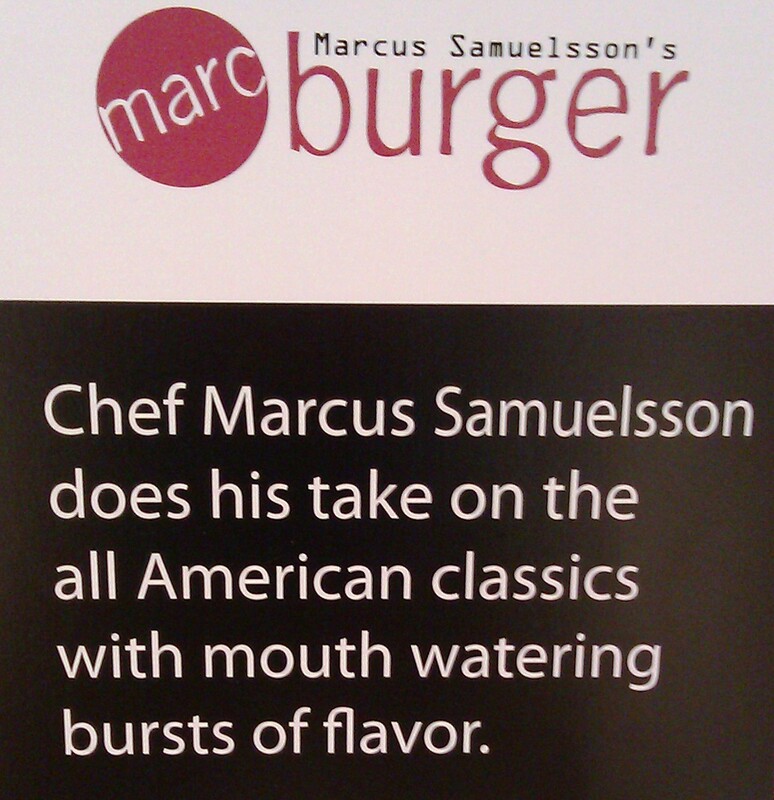 Chef Marcus Samuelsson put his name on this joint and another one at a Macy's in Chicago. He had already enjoyed success in NYC with Aquavit, Red Rooster, and Ringo (Japanese-influenced American food). It would have been super cool had Chef Samuelsson taken an active interest in the establishment that he lent his name to in Orange County, CA, because this joint was a disaster. Chefs Cat Cora and Nancy Silverton (the other two contributors to Macy's Signature Kitchen) would do well to look in and make certain that their personal brands are not being diluted by the culinary output of this establishment. Macy's Signature Kitchen was 1/3 Marc Burger. 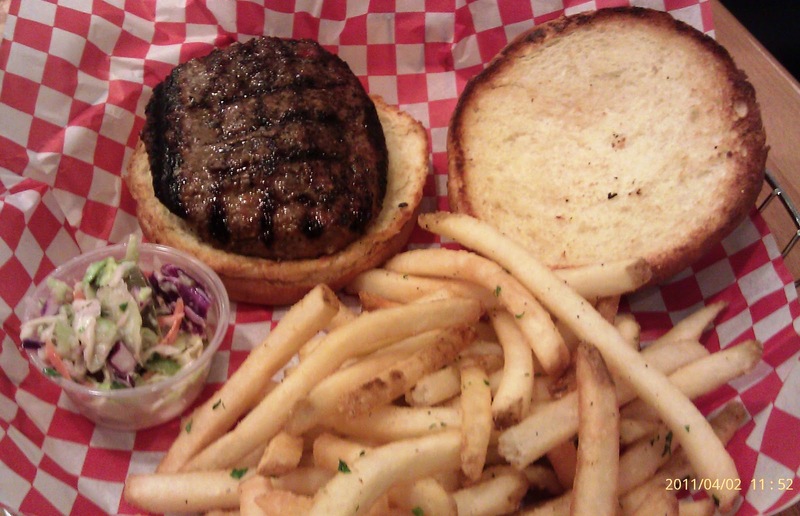 It should have been a no-brainer that the staff knew what cut of beef was in their burgers. After a couple of unsuccessful attempts to glean this minor detail, the manager was kind enough to bring out one of the boxes of 80:20, pre-formed patties from Gelsinger's Meats. The box did not reveal the cut of the beef either. It was safe to assume that this was Chuck. This truly was our queue to leave, and go somewhere else. We had walked past 4 places that also served burgers in this mall on our way to Marc Burger. Curiosity and stubbornness got the best of me, and we stayed the course. We ordered a couple of $8.95 cheeseburgers with fries and a couple of drinks. Yep, $8.95 for pre-formed patties from a cardboard box--and they charged that with a straight face. Total: $23.38 for the two of us. The Beef: The beef was greasy not juicy. Upon taking the first bite, clear liquid fat dripped over my fingers. The salt on the patty was pretty overwhelming, but it was still apparent that the beef was quite bland. It was also on the chewy side. There was no trace of aging in the bite. The claims on the website and signage was that we could expect 100% grass fed, all natural, Angus beef from local, artisinal farms and ranches. That sounded great--it was not reflected in the food. The Seasoning: The guy at the grill must have assumed that we were sodium deficient, because he was heavy-handed with the salt dredge. That was the sole seasoning I could taste, and there was way too much of it. The Sear: They got a decent grilled sear on the fatty beef...on the first attempt. The second time, my burger was cooked at too high of a temperature, and the patty contracted before the sear could properly develop. The Preparation: The beef was ground to a little finer than medium and mechanically formed into thinnish, uniform (5-6) ounce patties. This handling resulted in a chewy mouth feel. Since it arrived in a box, it caused me to wonder if it had been frozen and for how long. It certainly had the taste and feel of previously frozen ground beef. 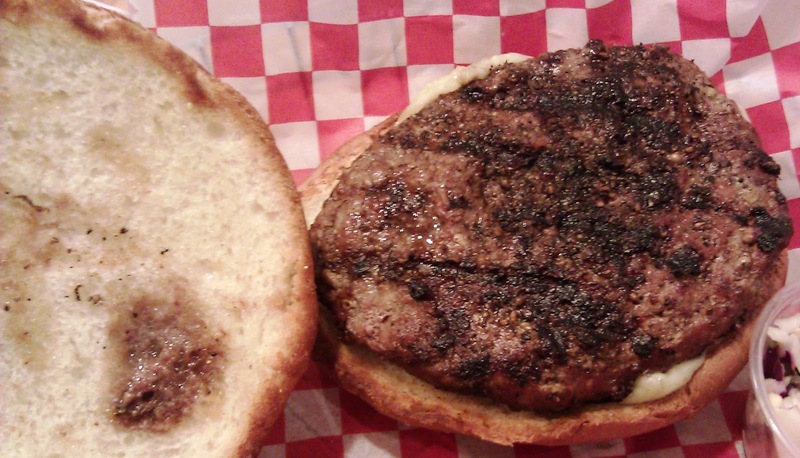 The patties were grilled on a very hot gas grill. 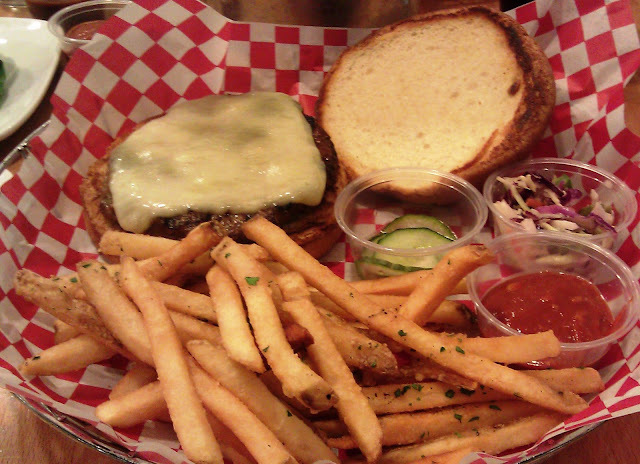 The flames, which burned a hint of char onto the patty flared up around the patties as they cooked. This would have been fine had there been flavors other than salt in the dish. The burgers were cooked to the desired temps. Medium for Happy Meal, and Med-Rare for me. I would have gone with Medium, but I was persuaded by the opinion on the nice lady at the cash register to order mine Med-Rare. She indicated that, in her estimation, the burgers lost flavor at hotter degrees of cooking. This should have raised flag, but I was already committed to stay the course. The stale bun is very apparent in the cross section. The Cheese: We had a choice of cheeses, and we went with the White Cheddar. The Cheddar was almost good. It took several seconds to develop flavor on the palate, because it was both oily and on the bland side. Still, the cheese was better than the beef. The Bun: This was where the dish went from boring to insulting. The buns were hard, stale, and barely toasted. I sent mine back, but Happy Meal was very hungry, so he sort of gnawed on his. One can note the degree of staleness in the below photo...the upper 2/3rds of the top bun did not compress as I sawed through it. The Meat To Bun Ratio: The stale bun clearly overwhelmed the greasy beef. The Fries: The fries were really darn good on the first attempt. They were crisp, perfectly seasoned, and golden brown. On the second attempt, the fries were far less crisp, pallid, and barely seasoned. The fries were a crap shoot. The Toppings: The tomatoes were under-ripe and had no business being served...if they couldn't find ripe tomatoes, they shouldn't have been serving tomatoes. The burgers came with a small serving of homemade pickles...the claim was that the pickles were the Chef's Swedish grandmother’s recipe (isn't that sweet?). His Swedish grandmother must have been Japanese, because the sickly sweet pickles were identical in texture and flavor to sunomono. There is a reason that sunomono is not served on top of savory sushi dishes...it would be jarring and awful.That would have been the outcome had we placed these flimsy, sugary pickles on our burgers. Maybe these pickles played well at Ringo in NYC. On a positive note, the spicy ketchup was pretty fantastic. They did re-fire my burger. The version with a fresher bun came back without cheese, and on this attempt there were deep creases in the patty, and it was bowed from the intense heat of a too hot grill. The creases demonstrated that the burger had been pressed on the grill to speed the cooking (press out any juices). The bun felt fine, though. By that point, I was in no mood for a third try at an over-priced, pre-formed, oily, Chuck disc/ Besides, Happy Meal was already itching to leave since he already ate a fistful of fries and as much of his burger that he could tolerate. Happy Meal skipped breakfast, and he did not get through more than a 1/3 of his cheeseburger. In the face of this nonsense, the manager was a champ. She comped the meal upon discovering what we were trying to choke down. She noted some additional issues, which she wanted to address with the kitchen. Keep in mind that we were the only customers, and we arrived at 11:30 AM. This was not due to the kitchen being "in the weeds." This was just alarming sloppy. Looking back, it was not surprising that we were the only people foolish enough to attempt a meal at Macy's Signature Kitchen. "...mouth watering bursts of flavor..." No, dry, stale, salty, chewy, and greasy did not combine to become that. Burger Review : This burger was prepared like mystery meat at a mall, and this burger tasted like mystery meat at a mall. Never again. Save your money, and go anywhere else. 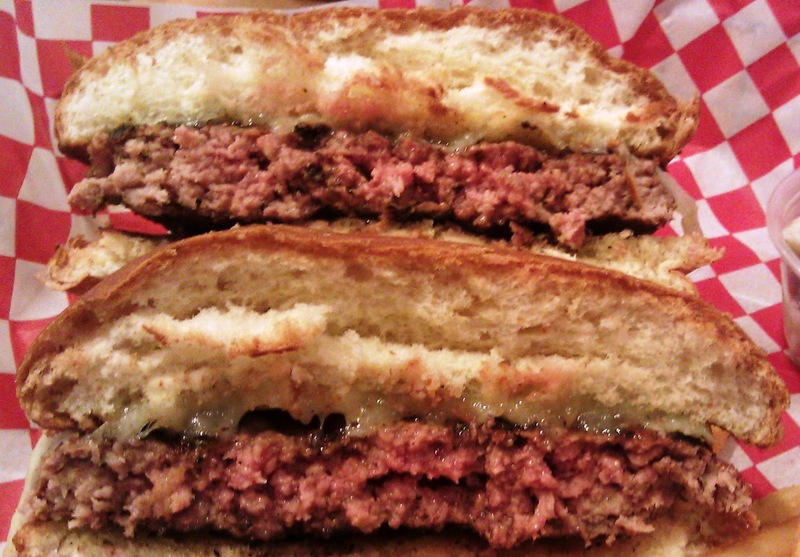 In 2010, OC Weekly actually had this in its Top 5 OC burger list. They had Red Robin on the same list as well. I wish writers would put more effort into these lists.